WASHINGTON — The United States is withdrawing from the United Nations Human Rights Council citing “chronic bias against Israel,” U.S. Ambassador to the U.N. Nikki Haley said Tuesday. 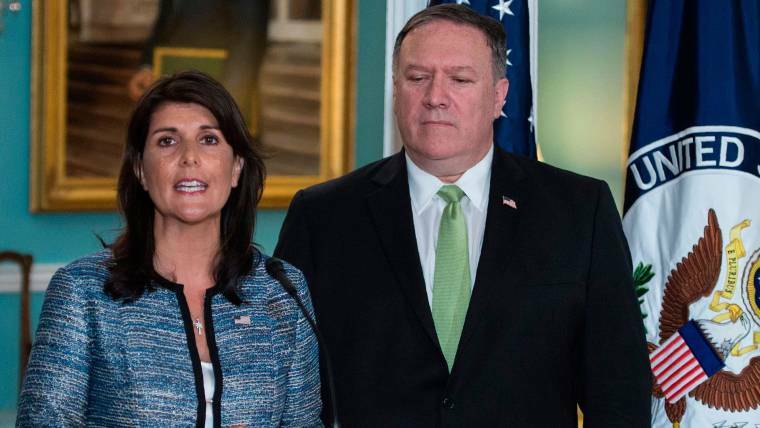 “For too long, the Human Rights Council has been a protector of human rights abusers, and a cesspool of political bias,” Haley said, according to remarks prepared for delivery, adding that the “essential reforms” that would have ensured continued U.S. participation had not been achieved. 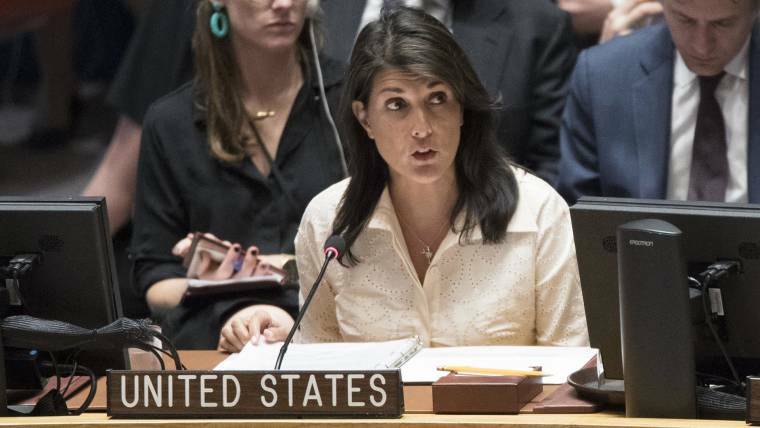 “Therefore, as we said we would do a year ago, if we did not see any progress, the United States is officially withdrawing from the UN Human Rights Council,” Haley said. Her announcement comes just a day after the U.N.’s top human rights official, Zeid Ra’ad Al Hussein, criticized the Trump administration’s “zero tolerance” immigration policy that has resulted in the separation of nearly 2,000 children from their parents at the border. “The thought that any State would seek to deter parents by inflicting such abuse on children is unconscionable,” he said Monday in an address to the council. Israeli Prime Minister Benjamin Netanyahu tweeted his thanks to the Trump administration for withdrawing from the “so-called” human rights council. “Instead of dealing with regimes that systematically violate human rights, the UNHRC obsessively focuses on Israel, the one genuine democracy in the Middle East,” Netanyahu said. Haley criticized the body as recently as March for its treatment of Israel. Previous administrations expressed concerns regarding the U.N. Human Rights Council, as well — often questioning the body’s willingness to have notorious human rights abusers as members of the council. John Bolton, now President Donald Trump’s national security adviser, has opposed the council since its creation in 2006. As the U.S. ambassador to the U.N. during the administration of President George W. Bush, he voted against the resolution creating the institution, rejecting the simple majority vote required to elect members and demanding exclusionary criteria to keep gross abusers of human rights off. “We must not let the victims of human rights abuses throughout the world think that U.N. Member States were willing to settle for good enough. We must not let history remember us as the architects of a Council that was a compromise and merely the best we could do rather than one that ensured doing all we could do to promote human rights,” Bolton said at the time. The Obama administration reversed the Bush administration’s position, and the U.S. was first elected as a member of the council in 2009. The U.S. move to withdraw extends a broader Trump administration pattern of stepping back from international agreements and forums under the president’s “America First” policy. Although numerous officials have said repeatedly that “America First does not mean America Alone,” the administration has retreated from multiple multilateral accords and consensuses since it took office. Since January 2017, it has announced its withdrawal from the Paris climate accord, left the U.N. educational and cultural organization and pulled out of the Iran nuclear deal. Other contentious moves have included slapping tariffs on steel and aluminum against key trading partners, recognizing Jerusalem as Israel’s capital and moving the U.S. Embassy to the holy city from Tel Aviv. Haley has been the driving force behind withdrawing from the human rights body, which would be unprecedented in the 12-year history of the council. No country has ever dropped out voluntarily. Libya was kicked out seven years ago.